A two-day program closing a series of events commemorating the 75th anniversary of Chicago Pile-1 (CP-1) began on Friday. The first event in the program was supposed to be an address by Richard Rhodes, author of the Pulitzer Prize–winning The Making of the Atomic Bomb. As Rhodes fell ill and was unable to make it, his address was read by William Lanouette, former Washington correspondent of the Bulletin of the Atomic Sciences, and author of a biography of Leo Szilard, instead. He concluded the talk by describing the bomb as a deterrent of world-scale war and nuclear energy as a clean source of power. This balanced the earlier reflection in his address of the experiment as a black day in the history of mankind. 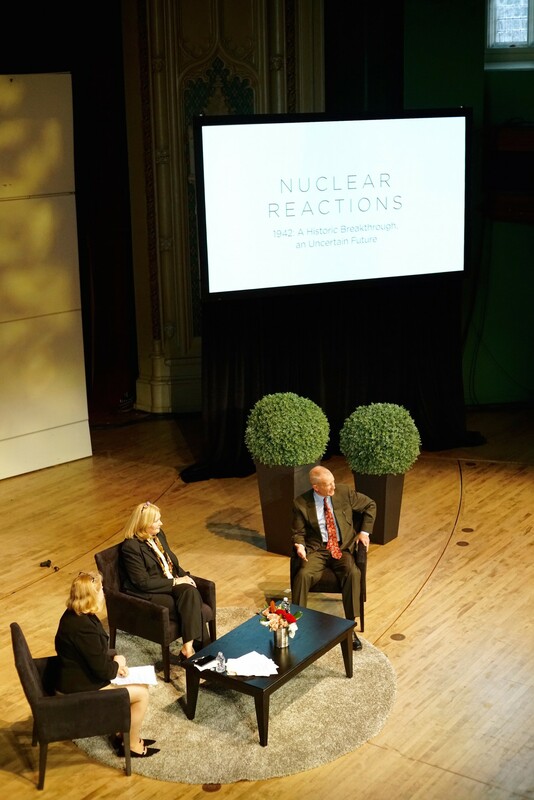 The first of three panels that afternoon, all moderated by Gretchen Helfrich, former host of Odyssey on WBEZ Chicago Public Radio, discussed the costs of nuclear energy relative to natural gas and other renewable sources, as well as the future of research and developments in energy. Much of the panel discussion revolved around the economics of nuclear energy, specifically the costs and externalities associated with it. The panelists were Chris Crane, president and CEO of Exelon Corporation, the largest energy provider in the United States, and Michael Greenstone, director of the Becker Friedman Institute and the Energy Policy Institute. Crane’s arguments in favor of nuclear energy were based on the high reliability and environmental benefits of nuclear power and called for research and innovation to make nuclear energy feasible. Greenstone focused on economic concerns, arguing that the cost of nuclear energy is currently too high. “I think the important question is how much are those extra benefits worth?” Both agreed that carbon should be taxed and called for innovation in storage methods. “We should get back to outcomes—is it a low dollar future or zero carbon future that the audience wants?” Crane asked in his closing argument. The second panel centered on the role of nuclear weapons in the modern world. Dennis Blair, retired admiral of the U.S. Navy and chairman of the Sasakawa Peace Foundation, a foundation dedicated to strengthening U.S.-Japan relations, and Madelyn Creedon, former Principal Deputy Administrator of the National Nuclear Security Administration, discussed international security and the threat of nuclear warfare. Blair argued that the nuclear bomb is almost impossible to use tactically. “Nuclear weapons are mainly useful for deterring the rivals from using a nuclear weapon,” he said. Creedon spoke on U.S.-Russia relations and international control, talking about the New START Treaty and the Non-Proliferation Treaty and her view that there is an increase in security as a result of these treaties. After the second panel and a short break, musicians from the Chicago Symphony Orchestra performed the world premiere of “Plea for Peace,” a piece commissioned by the University for the commemoration. Composed by Augusta Read Thomas, the piece meditates on the positive and negative effects of the nuclear age. The third panel on nuclear medicine in healthcare considered the public idea of nuclear medicine, specifically what panelists described as an over-exaggeration of the harms of nuclear medicine. They talked about how most people do not fully understand the importance of radiology and the uses of nuclear medicine. The panelists were Sanjiv Sam Gambhir, professor of radiology and chair of the Department of Radiology at Stanford University, and Martin G. Pomper, professor of radiology at Johns Hopkins Medical School. The event closed with a keynote address by Ernest J. Moniz, CEO of the Nuclear Threat Initiative and the former United States Secretary of Energy. Moniz spoke about the role of the Department of Energy in the Iran deal, as seven of the national labs contributed important analytics to policymakers. The address was concerned with the current state of nuclear weapons on the international scale, and Moniz seemed apprehensive about the future. “We can't solve any of our problems without some dialogue. We need to consistently minimize the use of nuclear weapons. Deterrence, deterrence, deterrence.” Moniz spoke about nuclear energy and climate change near the end of his keynote, calling for innovation to take a central role in order for nuclear power to be viable against the growing innovation in other renewable sources. 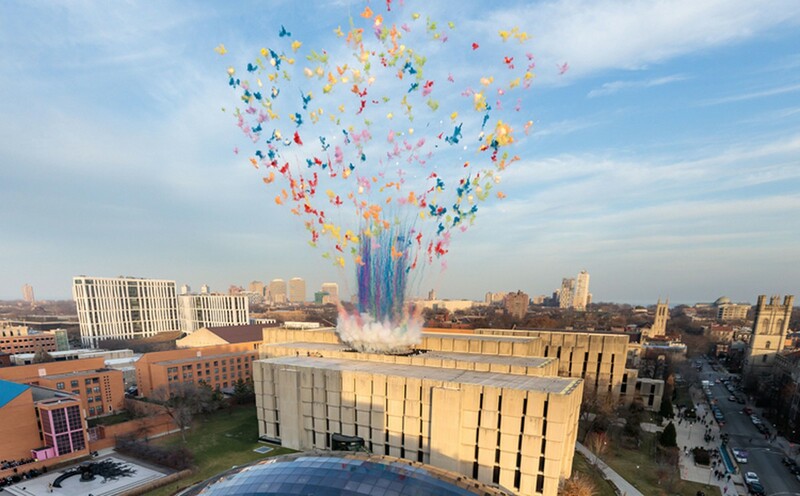 The anniversary programming continued on Saturday with an arts focus. 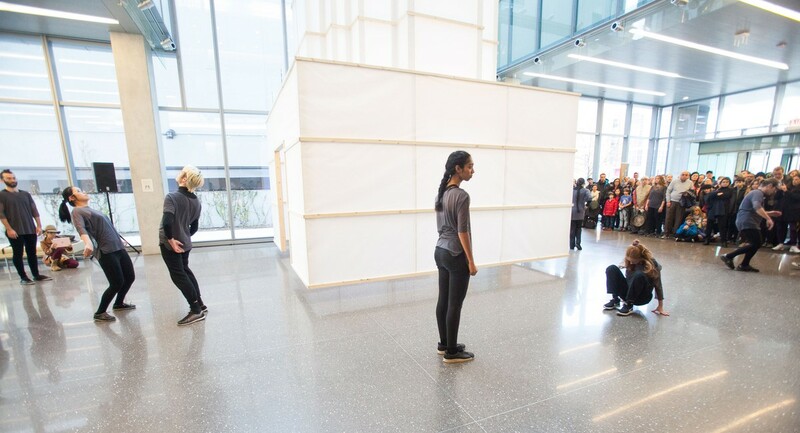 There was a performance of “Meditation on CP-1,” a movement piece by Prof. Young-Kee Kim, Asst. Prof. Sam Pluta and Yale University scholar Emily Coates. 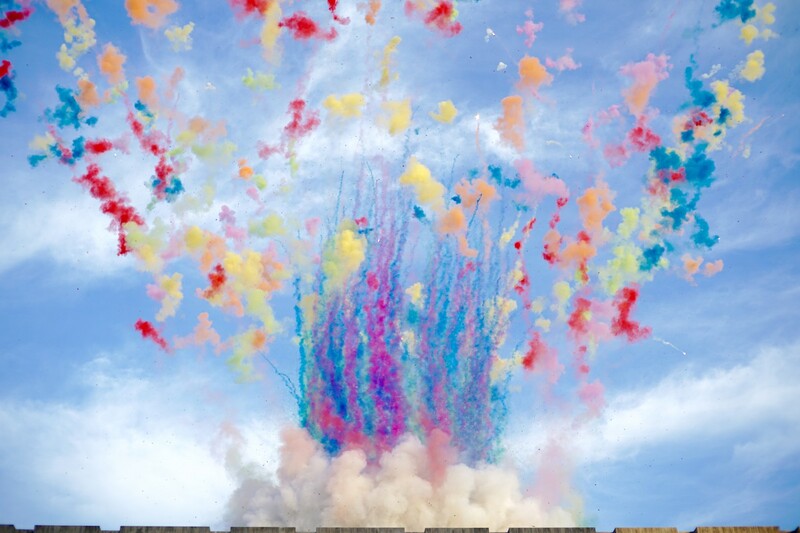 The largest spectacle was a pyrotechnic rainbow firework display by Chinese artist Cai Gui-Qiang. That was followed by a carillion performance of “The Curve is Exponential,” composed by PhD candidate Ted Moore and premiered by University Carilloneur Joey Brink. 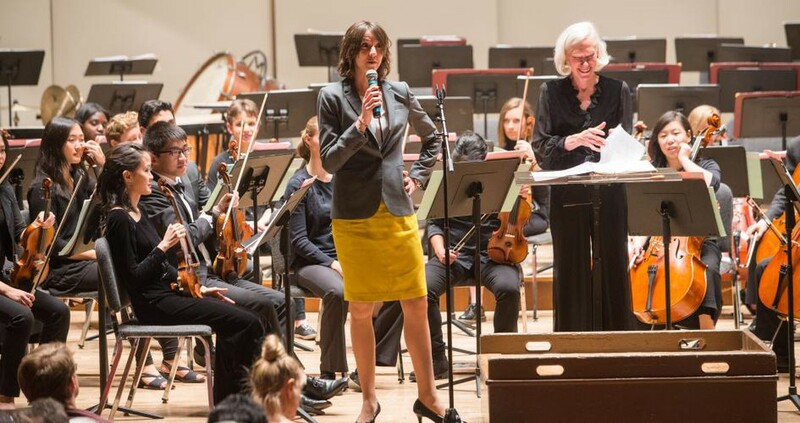 In the evening, there was a lecture on art in the nuclear age and a performance by the University Symphony Orchestra in Mandel Hall, featuring relevant works.